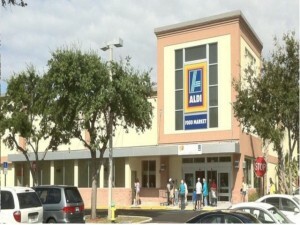 Palm Beach County’s first Aldi store recently had its opening celebration. The store opening, which was last Monday (August 29), even had a ribbon cutting ceremony. The new Aldi store is in Delray Beach, specifically on Linton Boulevard. It has only been in recent years that Aldi stores began to open in the state of Florida. The Germany-based discount chain first entered the state of Florida in September of 2008. Currently, there are about 50 Aldi branches in the state, and the discount chain has plans to put up more stores before the year ends. Currently, Aldi stores are located in Lauderdale Lakes, Pembroke Pines, Deerfield Beach and now Palm Beach County. Aldi has previously stated it has plans of opening at least 80 stores before 2011 ends. There are already more than a 1000 Aldi stores in the United States. The stores are scattered in 31 states, from the East Coast to Kansas. The giant discount chain first entered the United States market in 1976, when it opened several of its stores in the state of Iowa. Before the United States, there were already thousands of Aldi stores all over Europe. Aldi is known for offering grocery items at discounted or very low prices. The majority of the products sold in the stores are also private labels, which accounts for why the prices are relatively affordable. Despite selling mostly private label goods, Aldi also sells over a thousand branded products, which include fresh meat and produce. In some locations, Aldi stores offer wine and beer.